Color Wow Coconut Cocktail is the second Bionic Tonic I’ve tried out (you can see my Kale Cocktail review here) and I’m absolutely loving them. In the most basic terms, these are leave in conditioners or treatments. A recap on my hair, lots of bleach but holding up quite well despite that, fluffy and prone to frizzies even before bleach, but more so now with a touch of dryness. That said, I’ve been using the Kale Cocktail for quite some time now so perhaps that’s why my hair is holding up so well! Okay so while the Kale Cocktail is for strengthening weak hair that is prone to breakage, the Coconut Cocktail bonds a lubricating layer to the hair’s surface to restore silkiness which is just what my hair needs. To use, you just apply a coin sized amount to damp hair. The size of the coin depends on the amount of hair you’ve got, and I have found its a bit of trial and error to get it right. Apply it to the lower sections and ends of your hair, comb through and if at all possible dry your hair with a hair dryer, it will accelerate and enhance the effects of the product. The other great thing is that you can combine the Cocktails, so for the first couple of washes after I’ve had my hair coloured/lightened, I use both Kale and Coconut, before switching to using just Coconut alone. My hair is always going to be a bit fluffy, that’s my hair type, but wow, Coconut leaves my hair feeling and looking much nicer, and smoother. Oh and it smells glorious. That picture is actually a few weeks old now, my hair is a little blonder, a good couple of inches shorter and looking better than ever. £22 will get you 200ml and it lasts and lasts, becuase you need to use so little. I’ve said it before but I definitely recommend these Cocktails, and actually everything I’ve tried from Color Wow, so do check the website out! I’ve had my beady eye on Fortune Cookie Soap for a long long time. I never quite got round to placing an order, being afraid of the shipping charges and possible customs fees. 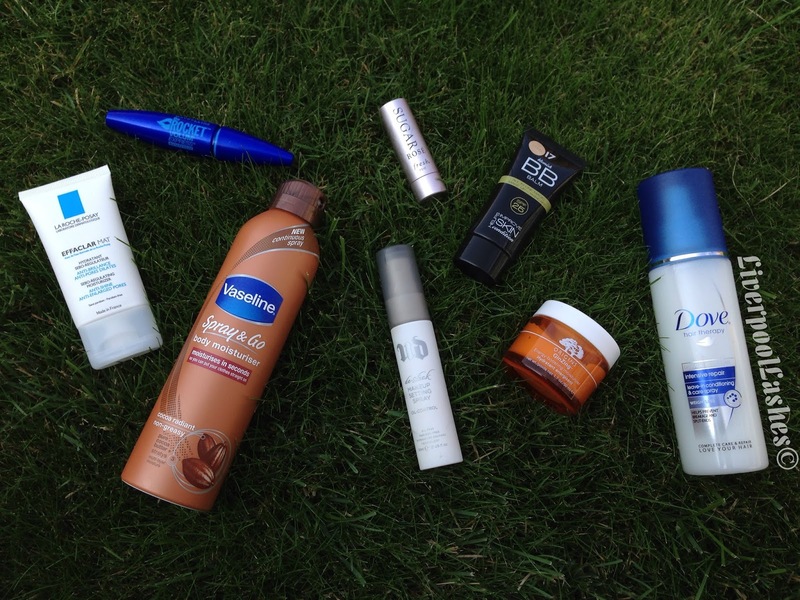 Eventually I managed to buy some products from a UK fan and try them out and I was hooked. I’ve since placed three orders and today I’m going to blog about my latest. I watch a huge amount of TV, American TV in particular, and I’ve especially loved Black Sails, Battlestar Galactica and Sons of Anarchy. Without question, my most enduring favourite is Game of Thrones. I don’t know what it is about it but I know I’m not alone. And when I heard Fortune Cookie Soap (FCS from here on in) were releasing a Game of Thrones inspired collection I knew I’d have to partake. I’m going to start with a little gripe, but it is my only gripe so I hope I’ll be forgiven, and thats the shipping. It’s extortionate meaning I have to very carefully limit what I purchase as the shipping increases with each product I add to my basket. I buy a lot from overseas and am very much used to a flat rate shipping fee, buying as many clothing items as I like from Black Milk in Australia for free, or make up for flat rates of $10.90. That said, I do appreciate that shower gels and jars of body lotion, are considerably heavier and as I say I really don’t know what the actual cost would be to say whether the charges are fair or not, but I do know I’d buy a lot more if my basket didn’t go up by $4 each time I add a body butter. In fact it’s the scrubs and body creams that seem to increase shipping the most so I can’t really afford to buy them. Enough, when I do order, I do so knowing what I am paying in shipping and budget accordingly. There are also UK Group Orders done once or twice a year for the bigger launches so they are worth looking out for (try facebook). Sooo the products I ordered. I can’t review most of these as I haven’t used them but I can talk about the scents. A blend of Italian bergamot, yuzu, fresh Meyer lemon and verbena perfectly blended with notes of olive leaf and sweet florals, finished with faint notes of patchouli, white musk, and cedarwood. It is BEAUTIFUL. I’m well used to the Body Wash formulas and they are highly lathering and heavily scented. A really fantastic product with the most stunning perfume. A warm arid blend of patchouli, sandalwood, and citrus with juicy notes of white peach and red mango. I’m delighted with this again. I’m so pleased with this collection, not only because of the Game of Thrones theme, but also because of my love of patchouli and earthy scents. This one is a touch lighter than the Body Wash thanks to the sweet fruit. It smells exotic and beautiful. Although Shampoo bars and Conditioner bars are not new for FCS, the combined bar is. The top layer is shampoo and the bottom layer is conditioner. I’m not new to the concept of solid hair products having tried Lush’s offerings, but they always turned my hair to crap, and I’m told FCS’s products are so much better so I’m excited to try this. Again, the scent couldn’t be more up my street, inspired by Jon Snow, this is a beautiful combination of Leather and Amber. Cannot wait to try this. The tin was just the obvious choice to store it in between uses. Saving the best til last in my opinion, this is glorious. I’m also totally annoyed I didn’t buy the larger bottle. I did have a little leakage, but it was well wrapped and my bottle seems full enough so I’m no inclined to complain, although I do hear that the FCS customer service is excellent. As a consequence of the light leaking, I got this on my fingers as I unwrapped it a few hours ago. Clearly you don’t need much as I can smell it so strongly still, much to my joy. Burgundy roses, carnations, and white florals with nuances of burgundy wine, sandalwood, and a hint of musk. I can smell it all, but I suppose overwhelmingly its musk and rose, it’s just, well stunning. Absolutely thrilled. So all in all I’m absolutely chuffed to bits with this order. I’d like to go back and make another order for the larger Perfume Oil, the Mother of Dragons Whipped Cream, the No Middle Ground Hydrate Me (my favourite products – a solid bar of moisturiser to be used on wet skin) and The Imp Mist Me, inspired by my favourite character Tyrion, it promises a rich blend of fresh black cherries, white wine, mahogany and teak woods, and a spicy note of freshly grated black pepper. I don’t get on with the Mist Me’s (body sprays) too well, finding the scent doesn’t last on my skin too well, I don’t even care, this sounds amazing. So, despite the heavy shipping to the UK, I would highly recommend Fortune Cookie Soap products. innovative, unusual, functional and whimsical, who could resist! Look out for the Soap Box subscription and the Alice in Wonderland themed collection due for Spring. I cannot wait. I don’t like volume on the top of my head. My hair just looks weird when it’s high. I do however like my hair to look voluminous everywhere else where possible and thanks to HER Haircare Rituals products I’m seeing some fantastic volume in my hair, as seen above! Firstly I love the packaging of the products, the simple black and white and the stylish logo. I’ve been using the Volumising Shampoo and Conditioner regularly since I received them and can give them a massive thumbs up despite a shaky start! A little bit of info about the brand. The brand was co-created and is co-owned by John Barrowman. Seems a bit random, but who cares, it’s a great brand. HER is based in Italy’s Veneto region and the surrounding areas have inspired the bottles and scents of the products. The Volumising Shampoo is enhanced with sweet almond protein to strengthen and fortify the hair which in turn gives more volume and more softness. The Volumising Conditioner feels like rubbing a face cream into your hair, it’s a strange sensation for someone so used to the slip of silicones! The reason it feels that is that it’s made with shea butter, then there are passion flower and acai oils along with rice bran an wheat germ oils and a dose of ginseng. So about that shaky start I mentioned. Me and my hair love silicone and most forays into silicone free shampoos and conditioners and the Her shampoo and conditioner are both Silicone free to say my hair objected is to put it mildly. My hair reacted by turning itself into a massive clump of tangled hair as I shampooed. It was painful to try and get the conditioner through it with a wide tooth comb. However, once I was out of the shower my hair was soft and clean feeling and definitely volumised. So I persevered. Next wash I used the same, wide tooth comb at the ready, teeth gritted. Nothing. The shampoo lathered with no tangling, the conditioner slid through my tangle free hair with ease. And that’s how it’s been every wash since. I’m sold. I can only assume that I had some build up of something that the HER products removed but that there was some kind of initial clash of products or something. Who cares anyway, now it’s lovely. It smells gorgeous, fresh and clean and it leaves my hair soft and volumised. And then there’s the Volumising Powder. The pot feels as though it has nothing it it, and to be honest I’m not sure how much is in there but you need very little so we’ll just have to see how long it lasts, but this powder is more than your average backcomb dust (which I usually avoid since I don’t like height on my crown). The powder adds body and texture but it does more. It gives the volume of a mousse, has the texture of a clay without being at all heavy, it controls like a hair spray and and can be reactivated, meaning you can just restyle without having to redo from scratch. It also cleans and refreshes. So versatile. I apply this to the roots of my hair, around the top, but avoiding the very crown of my head so that the volume is at the sides. Works like a charm. First of all I must apologise for the stock image there…I could have sworn I’d taken photos of the actual products…turns out I hadn’t and now they’ve all been used up…so I could stop this post there, the worlds shortest review, can there be any better review than “so good we used it all up”…. Anyhow, I’ll start at the beginning. 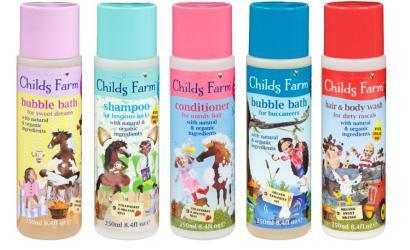 Childs Farm is a truly British brand of bathtime goodies for children. The products are affordable, organic and free-from, with beautiful packaging that really appeals to kids. This is the first kids’s range to include argan oil and my little monkeys both have lovely soft shiny hair as a result (actually they had lovely soft shiny hair in the first place, but dare I say it, they look a bit softer and shinier). We tried out the shampoo, conditioner and bubble bath and all were given the big thumbs up by Chloe and Lola. They were both particularly taken with the scents… the shampoo and conditioner are both Strawberry & Organic Mint…. it’s definitely more strawberry milkshake than mint though, and the bubble bath is Organic Tangerine and gave us a lovely amount of bubbles (with sodium coco-sulfate as the foaming agent. All in all this is a jolly good range and I should add that both of my girls suffer with eczema, one considerably worse than the other, and the products didn’t seem to affect the skin condition in any adverse way. Also available are various gift sets.